Every month we host a contest for artists who sell and display work through our online Art Gallery. Winners are selected by customer votes on Facebook and receive a cash award and promotion. November's winner is painter Robert Cantor. Cantor’s collection. 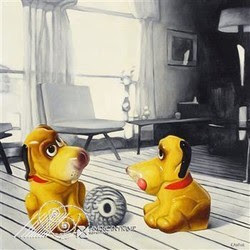 Made life-size and all the brighter and bolder by their placement in the monochromatic setting, the dogs are given an increased sense of animation along with a paradoxically heightened artificiality. Cantor’s formal training includes time at Northern Virginia Community College and Alexandra Art League School. He has won several awards and participated in many juried shows. “Ball Play” begs for a sophisticated, modern treatment such as the black, crisp lines of American Frame’s Standard, Standard Plus or Canvas metal collections. Two mats, a black primary with an off-white border, would offer the combination of simplicity and gravitas the work requires. 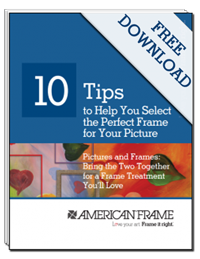 To contact Cantor or follow his work, visit his American Frame gallery or his website.